Dear print magazines: we still need (some of) you! 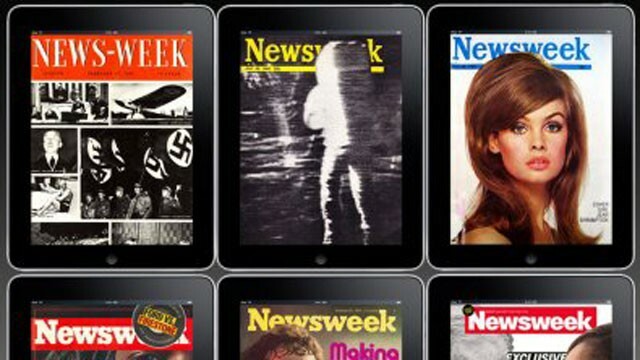 Let’s face it: Newsweek going all digital isn’t shocking. It’s necessary, as EIC Tina Brown herself told us in a video announcement on The Daily Beast. If you don’t evolve in this game, you become extinct. They dispense of you. Newsweek is actually in a dubious position. While I think The Daily Beast is one of the best news sites out there – I haven’t come across many taglines better than “Read This, Skip That” – as Felix Salmon notes, it’s unclear how even a digital-only version of Newsweek could survive. But beyond that, should the print version’s death say something about all other mags? I’d be lying if I said I’ve actually bought an issue of Newsweek in the past decade, but I did flip through my fair share at airport newsstands since Brown came in. No one can say she didn’t push the envelope with her covers – a few of the more memorable ones are here. And pushing the envelope is necessary, if not a solution. As I pointed out last week — when VIBE put Ke$ha on the cover with the cover line “Hip-hop’s guilty pleasure,” — taking risks and making statements is important. Whether people get it or not is almost secondary to pushing yourself to unexpected places. Too many people play it safe these days. I’m talking to you, Anna Wintour, with your requisite Gaga cover each year. I get it, she sells, but I still think I’ll live to see the day when you swallow your pride and put Kim Kardashian on the cover. Times are hard, and Kimcakes sells. So should that day come, think of me. This is why, in spite of Newsweek’s need to go all digital, I can’t say it’s right for everyone. Yes, there is still a need for this dinosaur. Maybe not for straight news, but for titles that cover the arts (fashion, beauty, music, movies, etc), business, tech, politics, and cultures within cultures, i.e. Latina, VIBE. But even some of those magazines have struggled. VIBE is actually interesting in that it folded in 2009 and was later resurrected. George Pitts, longtime photo director of the magazine wrote an amazing piece on the end of that era. I haven’t felt as connected to the magazine in its second reincarnation, but I’m happy it exists. I think what made VIBE great back in the day and won it several national magazine awards was that it captured a specific era of hip-hop and music — an era long gone. I also think there are currently too many hip-hop titles. The market is saturated and it’s not all quality. What Elliott Wilson, former EIC of XXL has built with Rap Radar is impressive – and a good model to follow. Latina is another example. I still feel it has its place, and as new players enter the space, like Cosmo For Latinas, I only hope this niche market has more and more choices at the newsstand. Then there’s the job of writing/editing for magazines. The way print editors think about stories is special. Everything that happens from a line-up meeting, to working with talented writers ( with whom you have the luxury of time to work toward the best story possible), to those late nights during shipping, to getting that first-bound in your hands, to that post-mortem on the past issue where you figure out how to do it bigger, better, next time around. And don’t even get me talking about conceptual covers – my favorite-est thing in the entire world. I remember when we put Biggie, Jam Master Jay, and Tupac on the cover of VIBE for the May 2005 issue, with the coverline: “Hip-hop Murders: Why Haven’t We Learned Anything?” Or the time we put 50 Cent on the cover of theApril 2005 issue recreating the iconic Scarface movie poster. I don’t think the work magazine editors do is something that journos who have only worked in online can really replicate or fully appreciate. As Sarah Lacy, the Editor-in-Chief of PandoDaily put it,there is a demand for long, heavily-edited content, and not enough people with the proper training to do it. On the other hand, there are many, many things that online-only journalists can school us senior citizens of media on. Every day I learn something new, something kind of amazing. The latest? Polyvore, which I’m sure has been around forever but I’m just now learning about it. What I appreciate is that it has a magazine-y feel to it. Naturally, I’m in love, and hope to do a lot of that on this here website. Also, there is the fact that celebrities give you a different (limited) kind of access when you ask for an interview for online versus print. And as long as celebrities have egos (imagine that), they’ll still cherish that magazine cover shot, the sit-down cover story interview, and that beautiful spread inside. From a consumer standpoint, I still marvel at gorgeous covers, like the one of Kate Hudson on Harper’s Bazaar, which I actually bought. Sometimes, I just need that tactile experience. I think of this, the February 2010 cover of Latina, for which my mentor Mimi Valdes sat down with Jennifer Lopez – someone she has developed a relationship with over the years and it shows in the writing. I consider this to be one of the most memorable interviews the superstar has ever done. And trust me – when you’re as media savvy as J.Lo, it takes a pro to get something fresh and meaningful out of her, something she hasn’t just said using different words to everyone. Kids, if you want to do this for a living, take notes. There’s something to what these magazine people have built. « Interview With Javier Bardem: Best Bond Villain Ever?